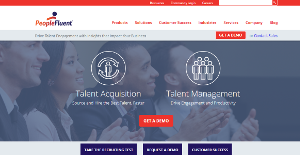 PeopleFluent is a human capital management platform that combines core functionalities and capabilities of talent acquisition, talent management, human resources management, talent development, and hiring compliance into a single suite. It is an innovative collection of applications designed to improve the way companies hire, develop, engage, motivate, and retain their employees. More than 5,100 enterprises and organizations from all over the world trust PeopleFluent to help boost employee engagement and performance to drive better business results. These companies include 80 percent of the Fortune 100’s list that now rely on PeopleFluent to create and implement effective talent acquisition and management strategies so companies and employees can grow together. PeopleFluent helps you attract the best and the brightest individuals to fill crucial roles in your organizations through powerful and innovative features that help filter your pool of candidates down to the most qualified applicants. The software does this by integrating contract/contingent sourcing and recruiting workflows to unify holistic talent acquisition and onboarding processes. Video and social collaboration transform your recruiting activities into innovative, interactive means for job seekers to display how they can be valuable to your enterprise early in the recruitment process. Video questionnaires allow applicants to demonstrate skills and capabilities, what they bring to the table if hired. For managers and recruiters, collaboration workspaces allow to share information quickly and thus fueling productivity and the speed of candidate review processes. PeopleFluent simplifies performance management, whether your employees are office-based knowledge workers, field technicians, maintenance professionals and everything in betwee. The software lets you set corporate and individual goals, relay these goals to your employees, and align your employees to your foal via feedback, talent development, and coaching so that their performance is elevated significantly and can make a relevant impact to both the company’s and the employees’ journey. PeopleFluent brings configurability without compromise via an industry-leading performance management solution that effortlessly adheres and adapts to your talent strategy, goals, and desired outcomes. The software also gives HR professionals the platform they need to empower managers with the guidance and resources necessary to find, acquire, and develop talent, as well as point out to the leadership the overall health and operational readiness of your organization. If you are considering PeopleFluent it could also be a good idea to examine other subcategories of Best Performance Appraisal Software collected in our database of B2B software reviews. Each business has its own characteristics, and might need a particular type of Performance Appraisal Software solution that will be adjusted to their business size, type of clients and staff and even individual niche they cater to. You should not count on locating an ideal software that is going to be suitable for every business no matter what their background is. It may be a good idea to read a few PeopleFluent reviews first and even then you should remember what the software is supposed to do for your business and your employees. Do you require a simple and straightforward app with only elementary features? Will you really make use of the advanced functionalities required by experts and big enterprises? Are there any particular tools that are especially useful for the industry you operate in? If you ask yourself these questions it will be much easier to find a trustworthy solution that will match your budget. How Much Does PeopleFluent Cost? We realize that when you make a decision to buy Performance Appraisal Software it’s important not only to see how experts evaluate it in their reviews, but also to find out if the real people and companies that buy it are actually satisfied with the product. That’s why we’ve created our behavior-based Customer Satisfaction Algorithm™ that gathers customer reviews, comments and PeopleFluent reviews across a wide range of social media sites. The data is then presented in an easy to digest form showing how many people had positive and negative experience with PeopleFluent. With that information at hand you should be equipped to make an informed buying decision that you won’t regret. What are PeopleFluent pricing details? What integrations are available for PeopleFluent? If you need more information about PeopleFluent or you simply have a question let us know what you need and we’ll forward your request directly to the vendor.